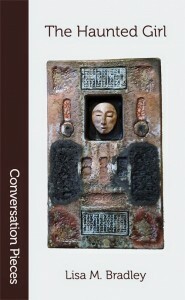 In her introduction to Aqueduct Press’ Conversation Pieces series, L. Timmel Duchamp offers a quote from Jonathan Goldberg to articulate its core purpose: “To look forward to the history that will be, one must look at and retell the history that has been told.” Numbering forty-three titles thus far — including collections of poetry, essays, short fiction, and more — the series is a fascinating endeavour, and one which I was keen to engage for this column. Having now read its three most recent publications — The Haunted Girl by Lisa M. Bradley, Elysium by Jennifer Marie Brissett, and Ghost Signs by Sonya Taaffe — I find I want not only to engage but to actively celebrate these powerful, versatile, mesmerizing voices and the people who enabled me to hear them. These books, in addition to being the most current Conversation Pieces, make a superb triple bill: here are poems and stories concerned with (among others) ways of being dead, ways of being alive, encounters with ghosts both literal and metaphorical, memories, echoes, speech and silence, freedom and constraint. It’s wonderful to read these books in sequence — and, in the spirit (badum-tsh!) 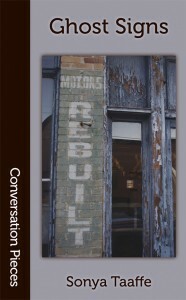 of the series title, exciting to place them in conversation with each other to see where they intersect and overlap. There is a theme, throughout the collection, of false prisons and false escapes, reflections on who and where one is and where one’s going. “I struggle against the pattern,” says the speaker in “embedded,” a poem about the tensions and expectations of family across generations, and I took it to be at the collection’s core: resistance to norms, to imposition, be they of language, sexuality, or mortality. There is a sharpness, a sting to most of these poems, of the kind that makes you hiss and then seek it out again. I loved the collection’s bilingualism, both in the presence of Spanish and the musings on being between languages, on the thermodynamics of translation. I loved how often the sheer inventiveness of the lines startled me — hot wind against a car window “keens with the steadiness of a seashell” in “Immobility,” while in “Teratoma Lullaby” a chimeric twin “is more than living gristle. / He is a ghost with heft and hate.” The poetry culminates in the staggering “we come together we fall apart,” a long poem about marriages and families and the damage of incompatible desires. It perhaps couldn’t be helped that, after being so thoroughly amazed by the poetry, I should find myself a little disappointed by the prose. This may well be more to do with me than the stories themselves; I suspect I’m not a very good reader of short horror fiction, as I’m often left wanting something the story wasn’t setting out to give (or was, in fact, deliberately withholding). While all the stories were characterized by the same dazzling invention as the poetry, putting intriguing spins on vampires, demons, and fairies in contemporary settings, I was sometimes left feeling the stories didn’t quite stick the landing, didn’t nail my heart to the wall the way the poems did. That said, I liked about half of the six stories, and of those genuinely loved “Bilingual, or Mouth to Mouth,” which pushed my language-loving buttons and gave me gorgeous writing to boot: “she was a thimbleful of darkness lurking under a mesquite tree” hooked me from the start. Overall, a very strong collection and one I heartily recommend. I’ve seen many reviews exclaiming in surprise that this is a debut, and I’m here to add my voice to their number. The concept is brilliant: A computer program inscribed on the atmosphere itself is malfunctioning, and in so doing is throwing up iteration after iteration of a single story, transforming it every time by changing the variables of gender, sexuality, location, and moment. In so doing, the novel throws into sharp relief our own social programming: It was fascinating to observe in myself the different reactions to a situation if the genders of the actors were swapped, to see where I felt more or less forgiving, more or less critical. The iterations are, in a way, echoes, but in the novel they operate in reverse: Instead of becoming fainter with each repetition, the echoes gain substance until we find ourselves at the heart of the shout that created them. The whole text is haunted by it, by a sense of its own lack of substance in the wake of it. There are moments that I felt were missteps: In particular, the rendering of one character as trans in a certain iteration, and that character’s subsequent narrative treatment, felt like a lapse into damaging convention in an otherwise shockingly original novel. But the flexibility of the concept, and Brissett’s dexterity in treating each iteration’s characters as whole people, however briefly glimpsed, makes room for other readings. And, overall, the circling of the novel’s originating event, the thing that damages the program and explains our interaction with it, is breathtaking and wonderfully satisfying. 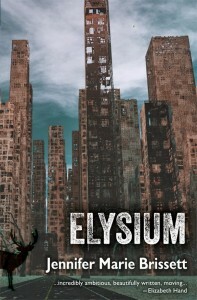 Elysium is an ambitious, challenging, and thoroughly absorbing novel, and I can’t wait to see where Brissett goes from here. What can I tell you but that my notes on this collection consist of a series of titles followed by “unbearably beautiful” and “lost time over this poem — so entranced, tears” and “Perfect. Crying.” What can I say but that Taaffe understands classical literature in a way that teaches it by default, that shares her knowledge like a meal. To read Taaffe writing of the ocean is to long for drowning; to read Taaffe writing of the theatre, of history, of haunting, of ghosts, of travel, of memory, is to feel yourself straining against the limits of your skin in order to fall deeper into her work. I’ve reviewed “The Boatman’s Cure,” the collection’s concluding novella, more fully for Tor.com; briefly, I will say that it unites all the successes of her poetry into a prose structure that follows the movement of an oar through water, and that the prose style is some of the most beautiful writing I’ve seen, bar none. If this column smacks, overall, of hyperbole, I can only say, in my defense, that I was given a broad remit in choosing what to review, and that I have excellent taste. So too do the good people behind Aqueduct Press; their Conversation Pieces will — in the best possible way — haunt me for a long time to come. * With thanks to Wondermark [wondermark.com/566]. Amal El-Mohtar’s essays have appeared in Chicks Unravel Time, Queers Dig Time Lords, Science Fiction Film & Television, Apex, Stone Telling, The Outpost, Cascadia Subduction Zone, and Tor.com. She reviews books for NPR, edits and publishes the poetry in Goblin Fruit, is a Nebula-nominated author and founding member of the Banjo Apocalypse Crinoline Troubadours, and has been known to deadlift other genre professionals. Find her on Twitter @tithenai.